The Ritz-Carlton hotels of Asia Pacific are set to hit a new milestone this week for Smile Asia – a global alliance of independent charities, as it launches its third regional fundraiser program which will bring total funds raised to over US$1 million.Smile Asia Week runs from May 2 to 8 and sees specially-crafted cakes sold to raise funds for the international medical charity which provides children with cleft lips or palates a reason to smile again. All 24 Ritz-Carlton hotels in Asia-Pacific are participating with over 10,000 ladies and gentlemen lending their skills and passion to their community and guests. Each pastry chef has lovingly crafting his own variation on the Smile Asia Week signature cake which features the universally popular flavors of chocolate and banana. At The Ritz-Carlton, Hong Kong, a specially created chocolate banana cake is available at HK$358. Executive Pastry Chef Richard Long combines the sweetness of mashed ripe bananas with the rich flavors of Valrhona chocolate, giving this cake a wonderful moist and soft texture that will for sure bring out that smile on anyone’s face. 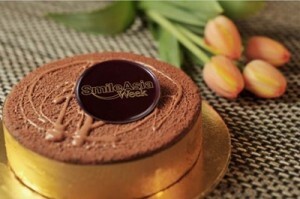 All cakes are sold exclusively through the website www.smileasiaweek.org. Customers from around the world can also arrange for cakes to be delivered to their loved ones and friends in Asia to celebrate a special occasion such as an anniversary or birthday and even Mother’s Day on May 8. All proceeds go directly to the charity and will be used to send medical volunteers on surgical missions across Asia. Volunteer ladies and gentlemen from The Ritz-Carlton are also participating in mission trips to remote locations in seven Asian countries to see firsthand how affected children have had their smiles restored. The volunteer work includes setting up the mobile surgery stations, patient registrations and numerous tasks to aid the success of each Smile Asia mission. To make the event more meaningful for the local community, The Ritz-Carlton, Hong Kong celebrates the spirit of giving in collaboration with Fresh Fish Traders’ School, a local primary school located in Tai Kok Tsui. Forty chocolate banana cakes were personally delivered to the school by the management team and volunteers from The Ritz-Carlton, Hong Kong on April 28, 2016. Students were given First Class Smile cards to recognize and thank one another, and these cards will be displayed at the school’s Smile Corner throughout the week. The management team of The Ritz-Carlton, Hong Kong also led the students in transferring their handprints onto specially designed t-shirts. Adorned with colorful handprints of various sizes, these t-shirts symbolize togetherness and how each small contribution adds up to make a difference in the community. The t-shirts will be sent to patients treated in mission trips, to pass on the blessings for their new lives with beautiful smiles restored. Funds raised in the previous two years totaled US$790,000 to support almost 1,000 surgeries and the contribution in 2016 is expected to be even higher, to help bring a total fund raised in three years to over US$1 million.